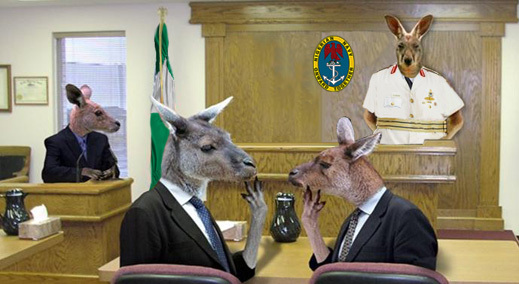 Nigerian judge, Okechukwu Okeke, failed to show up in his Lagos court yesterday for the scheduled trial on arms smuggling charges of the crew of the Myre Seadiver. There was no explanation for his non-appearance. The 15 Russian mariners were arrested, along with their vessel, on October 20 by the Nigerian Navy. They were then jailed for weeks before charges were formally laid by local police and prosecutor. Moran Security, a Moscow-based vessel protection group under contract to fleet operators for tanker security, says the charges were trumped up as part of a local extortion racket. Read the story so far here. Documents provided by Moran Security show the vessel master, Andrei Zhelayzkov, had submitted full details of the arms on board before entering Lagos port on September 19, and that the vessel agent, Blueseas Maritime Services Nigeria Ltd., had immediately confirmed port authority and Navy permission. A month later, as the Myre Seadiver was preparing to leave Lagos port, the Navy initiated the criminal allegations. The agent is refusing to comment on the evidence or the court proceedings. Nigerian Navy representatives are also not commenting. In a bail hearing on February Judge Okeke had released the crew from prison to the custody of the Russian Embassy. Local lawyer for the Myre Seadiver crew, Chike Okafor, said: “the court was unable to sit as we were told by the court’s registrar. My guess is that the [judge] must have gone to another judicial function or [was absent] on health grounds.” Another source at court said attempts to reach the judge yesterday proved fruitless. A new trial date has been set for April 30.